According to a recent press release published by The Tanzanian National Bureau of Statistic (NBS), Gross Domestic Product (GDP) at current prices during the third quarter of 2014 (July – September 2014) in absolute terms reached TZS 21.0 trillion, with a growth of +8.2% compared to TZS 19.4 trillion recorded in the corresponding period in 2013. Tanzania GDP at constant price for Q3 2014 in absolute terms, was TZS 10.7 trillion compared to TZS 10.0 trillion for the corresponding quarter of 2013. Tanzania GDP increased at a growth rate of 6.8% in the third quarter of 2014 compared to 7.4% for the corresponding period of 2013. 2014 third quarter GDP estimates at current and constant price is the first quarterly release in the revised GDP series based on, the 2007 base year. The agriculture sector registered a growth rate of 2.0% in the third quarter of 2014 compared to 3.4% recorded in the similar quarter of 2013. Mining and quarrying activity recorded a growth rate of 5.2% in the third quarter of 2014 compared to 3.3% in the similar quarter of 2013. Diamond production in the third quarter of 2014 was 66,508 carats compared to 27,828 carats produced in the reference period in 2013. Manufacturing activity recorded a growth rate of 10.8% in the third quarter of 2014 compared to 10.4% in 2013. The growth was attributed to increased production of food and tobacco products, textiles and cement. 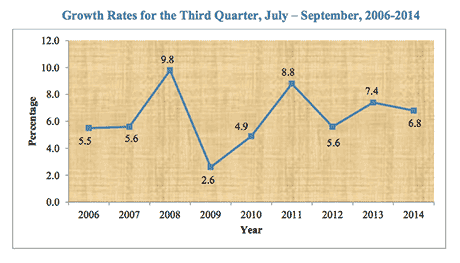 Financial Intermediation and Insurance increased by 7.3% in the third quarter of 2014 compared to 6.8 % in the third quarter of 2013. Real Estate increased by 2.2% in the third quarter of 2014 compared to 2.1% of the reference period under review in 2013.